My lovely niece Alexis requested this quilt after learning that the father of two of her good friends at school had been diagnosed with leukemia. We worked together to come up with a design we liked. She wanted something simple, in part because we wanted to work quickly, and it needed to be suitable for a man. I set up a Etsy favorites list with sample fabrics and possible quilt designs and we texted back and forth with ideas. We chose a Quiltcon bundle of fabrics, which I’ll try to link here once the shop is back from vacation. The colors are bright and happy, and not “girly”. We started with a plan of cheerfully random half square triangles, and I started cutting and sewing. As I was sewing, I prayed for him and thought about him sitting under the quilt. I started to imagine our prayers laying over him, and realized I could make a border of gray along the sides and let the riot of colors in the middle visually represent our prayers. When he lays under the quilt, the colors will cover his body, so he can see our prayers for his health. My niece liked the idea, so our random quilt became more focused and found its name, the Healing quilt. So the quilt is off to its new owner in Tennessee. I don’t know if he’ll realize the backing was picked because it’s the colors of the University of Tennessee at Knoxville, where his kids attend school with Alexis. 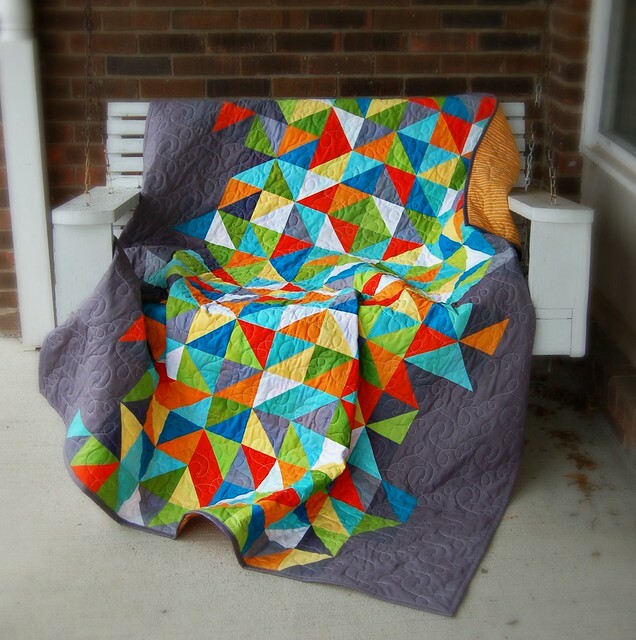 (I also threw in just a few extra orange and white half square triangles, not an obvious amount but maybe just enough to ensure that a true fan might feel drawn to the quilt.) I do hope this will help him see that he is loved and cherished, and that many, many people are hoping he’ll soon be well again. And just because I couldn’t help it, I took a picture of the Healing quilt with my not-quite-finished dining room wall. I pulled many of the colors in the wall directly from the quilt fabrics. What a wonderful gift. 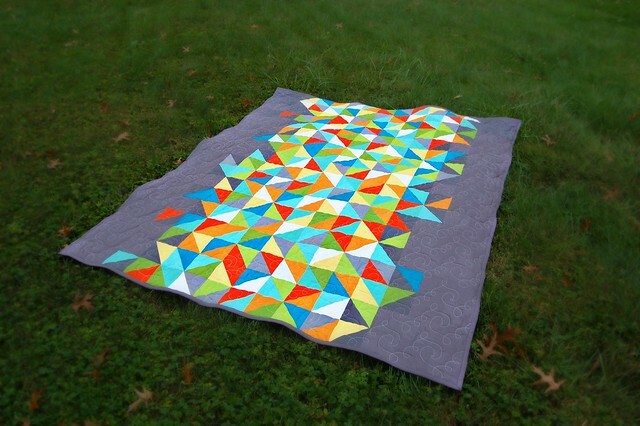 This quilt is gorgeous and will bring so much comfort. Well done. Such a pretty quilt. What a nice deed by you and your niece. 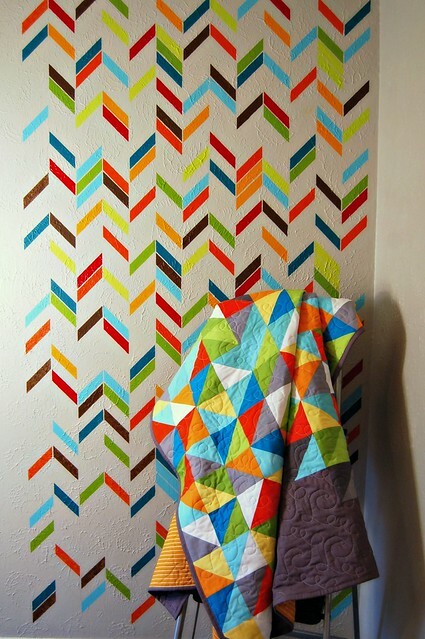 I think your wall may inspire a quilt too. I’ve been battling cancer for 4 years. My sister made me a quilt when I started my first round of chemotherapy- all Kaffe fabrics – which are my favorite. The quilt has been with me for all the many rounds of chemo and surgery – covering me in the hospital, oncology center and at home. A healing quilt is such a wonderful gift and I know the recipient will feel the love every time he uses it. Paula, I’m sorry for all you’re going through, but so glad you have such support. I love Kaffe fabrics, I bet your quilt is beautiful and full of gorgeous color! I hope your health is improving, that your body gets stronger by the day, and that you continue to feel the love and support of those around you. That would be a great idea, Michelle! Along with the warmth, it’s got to help to have the feeling that your family is with you while going through treatment. Having a quilt made just for you, that you can keep with you, it’s a special thing. I hope you’ll follow that thought and make him one! This is really beautiful – the design is amazing. I’m working on two signature quilts for different people starting chemo. It is sad but it is so nice to be able to do something to help! There is an amazing charity in Columbus, OH that makes a quilt for everyone women that is treated for cancer at the local nationally renowned clinic. http://stitchingsisters.org/ It’s an incredible effort. I don’t know why I didn’t realize until now what a perfect gift a quilt is for a cancer patient! That’s wonderful that you’re making TWO to share. It has to be such a comfort, and I know it’s a constructive way to contribute to their care. Thank you also for sharing the link! I gave it a little look already and love how they accept all kinds of help, even non-sewing. They happily receive scraps, so I’ll have to keep them in mind if my stash ever gets out of hand.